The Appendix (or Vermiform Appendix) is a narrow worm-like diverticulum, about 2 cm below the ileocaecal junction. It originates from the posteromedial wall of the caecum. The length of the appendix varies from 2 to 20 cm (with an average of 9 cm). The typical width is all about 5 mm. With age, there are changes in the diameter of lumen. It’s more in children than adult and often obliterated after mid-adult life. The length also changes with age. It’s longer in kids than in adults. The appendix presents 3 parts- base, body, and tip. The base is connected to the posteromedial wall of the caecum about 2 cm below the ileocaecal junction. All the 3 teniae of caecum converge to the base of the appendix. This anatomical fact acts as guide to the surgeon to look for the appendix during appendicectomy. The body is a narrow tubular part between the base and the tip. The tip is the least vascular distal blind end. It might be directed in different directions. The base of the appendix is indicated on the surface by a point 2 cm below the intersection between the transtubercular plane and the right mid clavicular line (right lateral plane). The point representing the base on the surface (vide supra) and McBurney’s point don’t precisely correspond anatomically but they’re in close approximation topographically. 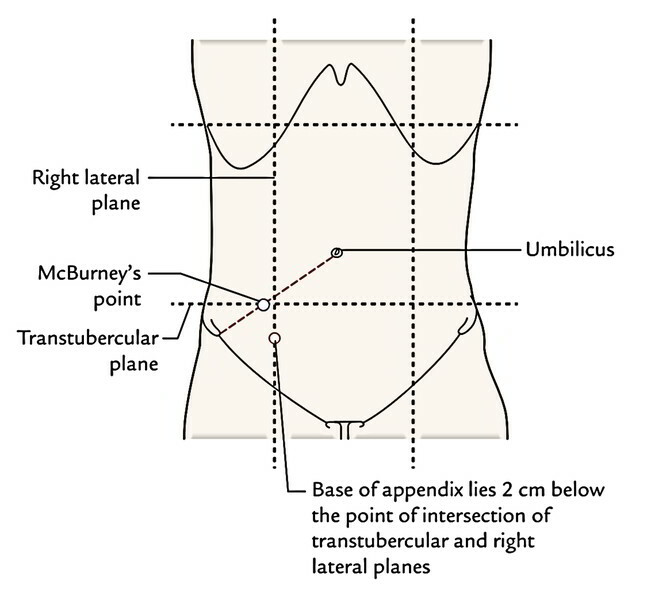 Because of this, clinicians equate the surface marking of the appendix to McBurney’s point. The appendix typically is located in the right iliac fossa. The base of appendix is mended but the rest of the part may inhabit any of the following places that are usually shown with an hour hand of a clock. In the Figure below ‘A’ is for actual positions and ‘B’ is for positions according to the needle of clock. Paracolic (11 o’clock) position: The appendix enters upward on the right side of the ascending colon in 2% of the cases. Retrocaecal/retrocolic (12 o’clock) position: The appendix enters upward behind the caecum and the ascending colon. It’s the commonest position (65.28%) of the appendix. Splenic (2 o’clock) position: The appendix enters upward and medially in front of (pre-ileal) or behind (post-ileal) the terminal part of the ileum. The tip of appendix points toward the spleen. The pre-ileal position is the most dangerous because inflammation from the appendix disperses into the overall peritoneal cavity. The pre-ileal position takes place in 1% of the cases and post-ileal in 0.4% of the cases. 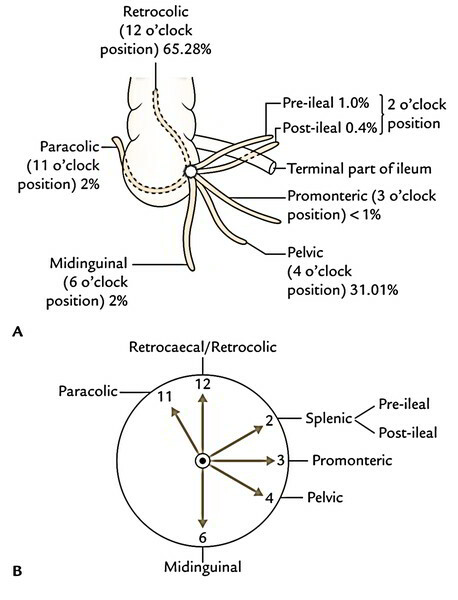 Promonteric (3 o’clock) position: The appendix enters horizontally toward the sacral promontory. The position is quite infrequent (less than 1%). Pelvic (4 o’clock) position: The appendix descends downward and medially, and crosses the pelvic brim toenter the true pelvis. In females, it can be associated with the right uterine tube. It’s the 2nd commonest position (31.01%). Midinguinal/subcaecal (6 o’clock) position: The appendix enters vertically downward below the caecum (subcaecal) and points toward the inguinal ligament. It happens in 2% of the cases. 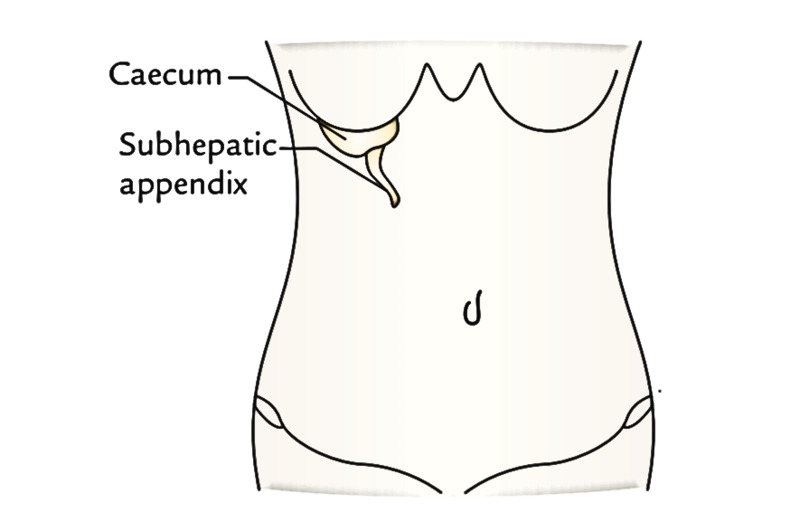 Subhepatic appendix: It’s an abnormal position of the appendix where it is located underneath the liver in the right hypochondrium. It’s a development anomaly, which takes place because of failure in the descent of caecal bud. The caecum and appendix grow from caecal bud that originates from postarterial section of midgut loop (near its apex). Following the return of herniated midgut loop in the abdominal cavity, the caecal bud inhabits the subhepatic position. When the postarterial section of midgut loop elongates to create ascending colon, the caecal bud slowly descends to get to the right iliac fossa. The arrest of its descent leads to subhepatic position of caecum and appendix. The inflammation of subhepatic appendix causes pain and tenderness in the right hypochondrium and may mimic acute cholecystis (inflammation of the gall bladder). The vermiform appendix is an intraperitoneal structure. The appendix is suspended by a small triangular fold of the peritoneum originated from the posterior/left layer of mesentery of the ileum. It’s termed the mesentery of appendix or mesoappendix. The appendicular artery runs inside the free margin of mesoappendix. Sometimes the mesoappendix neglects to get to the apex of appendix. 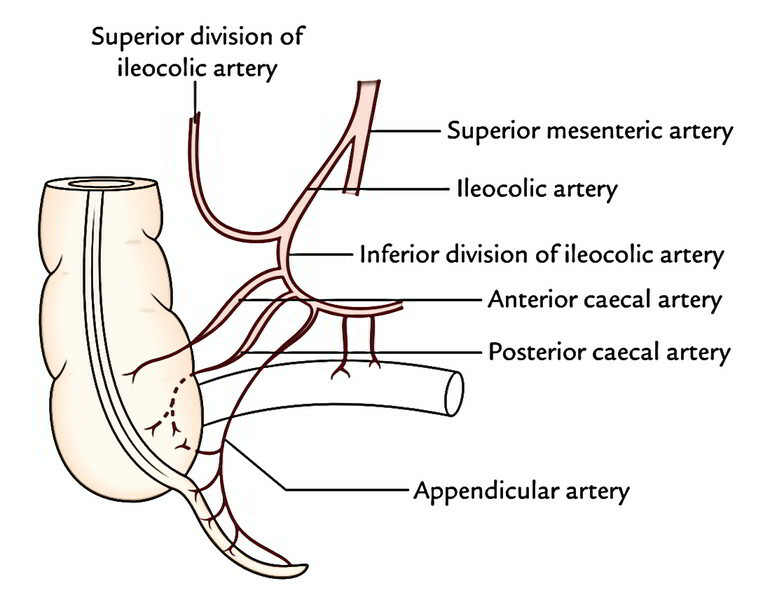 The appendix is supplied by just one appendicular artery, a branch of inferior division of ileocolic artery. It enters behind the terminal part of the ileum to goes into the mesoappendix and runs in its free margin to get to the tip of appendix that is the least vascular part. The appendicularartery is an end artery. When the mesoappendix is short, the appendicular artery rests directly on the appendicular wall near the tip of appendix. In appendicitis, this part of the artery is changed and thrombosed, resulting in gangrenous change in the tip that might perforate. The vein corresponds to the artery and drains into the superior mesenteric vein which in turn drains into the portal vein. The lymph vessels of the appendix drain into ileocolic lymph nodes directly or via appendicular nodes in the mesoappendix. The sympathetic Nerve Supply, which carries the pain sensations from the appendix, is originated from the T10 spinal section via lesser splanchnic nerve and superior mesenteric plexus. Because of this, the pain of appendicitis is referred to the umbilical region. The parasympathetic Nerve Supply is originated from both vagus nerves. The appendix has comparatively small angulated circular lumen as compared to its thick wall. 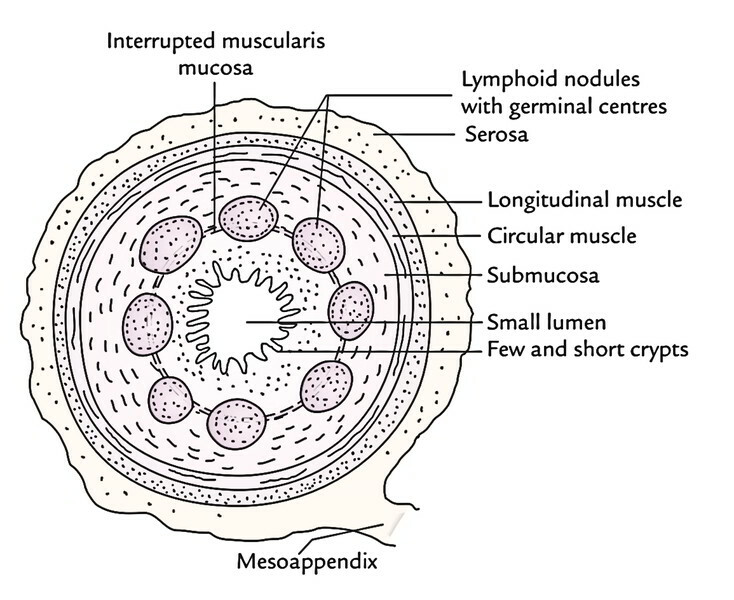 The wall of the appendix includes 4 layers from inside outwards, these are: mucosa, submucosa, muscular layer, and serosa. Mucosa: The face of the mucous membrane is lined by the simple columnar cells and numerous goblet cells. It’s devoid of villi. The intestinal glands (crypts of Lieberkuhn) are few and short. Submucosa: It includes a ring of large lymphoid follicles with germinal centers. Thus, the appendix is usually regarded as an abdominal tonsil. Muscle layer: It includes outer longitudinal and inner circular layers of smooth muscle. Serosa: It’s created from visceral peritoneum. Muscular is mucosa is interrupted by lymphatic nodules. The inflammation of the appendix is referred to as appendicitis. Acute appendicitis is a typical event and is a surgical emergency. It generally happens because of obstruction of its lumen by fecaliths or edema. The first pain of appendicitis is the referred pain and is felt in the umbilical region because both have same segmental Nerve Supply (i.e., T10 spinal section). Slowly the pain is localized in the right iliac fossa. It’s because of participation of local parietal peritoneum (i.e., parietal peritoneum in the region of right iliac fossa). The overlying musculature goes through spasm causing safeguarding of anterior abdominal wall. On palpation maximum tenderness is generated at McBurney’s point that is indicated on the surface by a point in the junction of medial two third and lateral 1-third of a line going from the umbilicus to the right anterior superior iliac spine. When the appendix is retrocaecal in position it is located on and irritates the right psoas major when inflamed (appendicitis). The forced expansion of the right thigh in such patients causes upsurge in pain in the right iliac fossa. When the appendix is pelvic in position, it might irritate the obturator internus muscle. The flexion and medial rotation of the right thigh on the abdomen causes pain in the lower abdomen. The incision for appendectomy is just based upon the anatomy of the anterior abdominal wall. A gridiron (5 shape of a cross beam) incision is given (i.e., incision is given at right angle to the spino-umbilical line) in the right iliac fossa. The 3 flat muscles are split along the direction of their fibres. The fascia transversalis and parietal peritoneum are incised together. The appendix is delivered via the wound and cut at its base and removed.